On October 28, 2005, Trevor James was born. By all accounts he was a healthy young man. He was my biggest baby yet, at seven and a half pounds. After a few relaxing days at the hospital together, we left together to introduce him to his new home and two other “moms”…his siblings, Kelsey, 3 ½, and Emily, 1 ½. Life with three was remarkably easy at first. This was largely due to the fact that Trevor, unlike his sisters, liked to sleep quite a lot. Unfortunately, my husband and I did not recognize his sleepiness as a symptom of a greater problem. 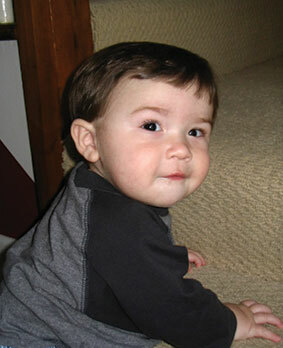 Around six weeks of life, Trevor’s weight gain was not what his pediatrician would have liked it to be. He was gaining, but not a lot. I was advised to wake him every three hours to eat and come back in a week for another weight check. Throughout that next week, the baby that used to sleep all the time became increasingly awake and inconsolable. I had had a VERY fussy first baby so I thought that the “honeymoon” was over and I was now dealing with another fusser. However, I was relieved when, at the end of that seventh week, I had a reason other than fussiness to bring Trevor back to the pediatrician’s office. He had a slight amount of discharge from his eye. I thought I would go in, get an eye cream, and vent a bit about my crabby little guy. I was NOT prepared for our world to be turned upside down. The doctor took a look at Trevor and was really pleased with his recent weight gain. He took a specimen from his eye, and, lastly, listened to his heart. The doctor looked at me and informed me that Trevor had a very noticeable heart murmur. Nobody had ever mentioned this before so I was in total disbelief. The doctor sent us to the hospital to get an EKG and chest X ray. As the EKG progressed, I could tell that something was not right. People started working at a more frenzied pace. As they looked at Trevor, my stomach began to turn because I could tell they were very worried about him. Finally, somebody explained his condition. He had a congenital heart defect, Total Anomalous Pulmonary Venous Return, and was not getting enough oxygenated blood circulated throughout his body. It turns out that he slept so much because he didn’t have the energy to do anything else. The cardiologist compared him to somebody constantly running on a treadmill. He wasn’t gaining weight because he burned more calories than he could consume. In the past week, when his weight gain was great, it was because fluid was accumulating in his lungs, thus making him inconsolable. Nobody had overlooked a murmur in previous check-ups. Sometimes with TAPVR, the murmur does not present until the 6th-8th week of life. It was all starting to make sense, but yet I still couldn’t believe it. The gravity of his situation hit me hard as we were being loaded into an ambulance on our way to Children’s Memorial. I remember thinking, “this is so bad they won’t even let me transport him to the hospital myself.” The only thing that got me through the next 36 hours, as we awaited surgery, was the fact that I had been told his condition was fixable and he could lead a normal, healthy life once it was fixed. On December 19th, I was given the best news of my life. Trevor’s surgery was done and he was doing well. Thankfully, he continued to recover amazingly well. We spent his first Christmas in the hospital and, although that was truly depressing at moments, I was reminded of what Christmas was really about every time I looked at Trevor. The dedication of staff and spirit of giving at Children’s Memorial Hospital was absolutely remarkable. Trevor just celebrated his first birthday and is the picture of a healthy, active toddler. I am amazed by how resilient children are and how brave they can be even when they are too young to realize it. I feel beyond blessed to have had the quality of care Trevor received so readily available to us. It is my hope that all children with congenital heart defects will be able to obtain the same quality of care, and that, with continued research, no parent will have to hear that their child’s heart defect is not fixable.